If you’re facing drug charges in Colorado, you have a right to qualified representation no matter how severe the offense. The Denver criminal defense attorneys at Wolf Law handle a wide range of drug-related cases, including drug possession and drug trafficking offenses involving six of the most heavily trafficked drugs—methamphetamine, powder cocaine, marijuana, crack cocaine, heroin and oxycodone—as well as other controlled substances. To learn more about your options following a Colorado drug arrest, please call Wolf Law at 720-479-8574 for a free case evaluation. If you’re facing drug charges, the Denver criminal defense attorneys at Wolf Law are here to help. According to the U.S. Sentencing Commission, drug offenses are the most common type of federal case; drug charges represented almost one-third of all cases reported to the commission in 2015. Of these drug offenses, nearly 90 percent involved drug trafficking charges. Colorado’s Amendment 64 was enacted in November 2012 and allows for personal possession, cultivation, and private use of marijuana for those 21 years of age and older. Following the adoption of Amendment 64, marijuana-related charges reduced statewide (not including Denver) by 80 percent from 2010 to 2014; and all drug charges are down 23 percent respectively. 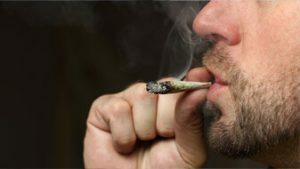 The Denver Department of Safety reported a 77 percent reduction in marijuana possession offenses from 2012 to 2014. Today, marijuana drug possession charges are namely defined by an amount in excess of 1 ounce, which is the legal limit a person may purchase from a retail marijuana store. Drug charges often involve addiction, dependency, and abuse. At Wolf Law, we understand the sensitivity of drug crimes and how drug charges impact families and the community at large. While other drug defense attorneys in Denver may approach drug charges with a hatchet, we prefer a scalpel; this ensures every client gets the help they need, the representation they deserve, and a fair trial. We take every step to ensure relevant details are made clear to the judge, the prosecutor, and the jury. The social, economic, and cultural complexities of a Denver drug case should not be ignored. Denver has distinct racial disparities among marijuana charges, which have remained constant despite Amendment 64, including a disproportionate number of offenses correlating public consumption and people of color. If you have questions related to drug charges, we can help. Call 720-479-8574 for a free case evaluation. Colorado state statutes and the Denver Revised Municipal Code outline laws and penalties for specific drug violations. Schedule I drugs are considered most dangerous, highly addictive, and have “no legitimate medical use.” Schedule I drugs include controlled substances such as heroin, LSD, ecstasy, and marijuana. Schedule II drugs are considered addictive but may offer some redeeming medicinal properties. 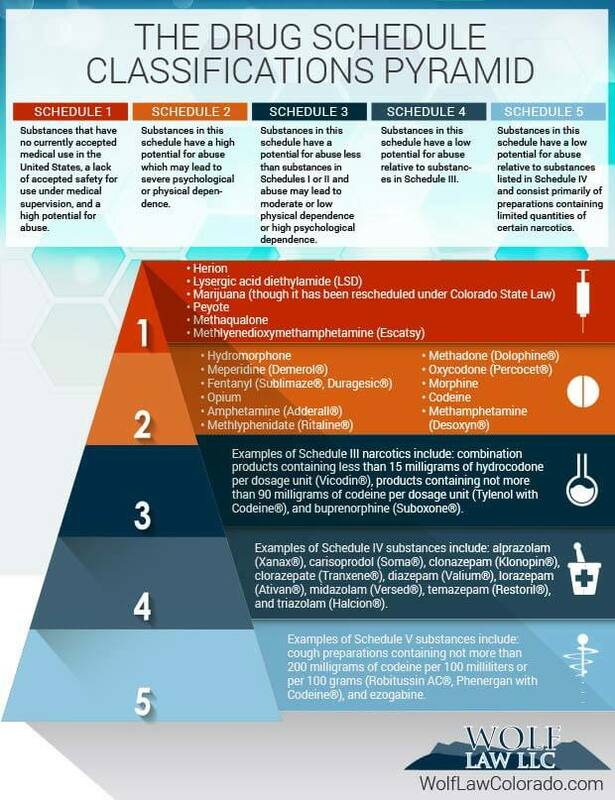 Common schedule II drugs include morphine, codeine, and Adderall. Schedule III drugs are considered less dangerous than those in schedules II and I. These drugs may include combination products like Vicodin, or non-narcotics like ketamine. In Colorado, all drug possession charges are classified by schedule, with the exception of marijuana. Drugs like codeine, and other common pain medications, may be possessed lawfully with a valid prescription. Colorado drug penalties depend on the offense or act committed, the type of drug, and the drug amount involved in the charges. Generally, all Colorado drug charges fall into three categories: petty offenses, misdemeanors, and felonies. Petty offenses are punishable by the fine amount assigned to the offense in the Colorado Code. Petty drug offenses include things like public consumption of marijuana or possession of drug paraphernalia. Misdemeanors are more serious than petty offenses but less serious than felonies. Drug misdemeanors are either DM1 or DM2. DM1: These misdemeanors are the more serious offenses. Examples of a DM1 offense include distribution, manufacturing, or possession with intent to distribute; or cultivation of less than 6 marijuana plants. Penalties for these offenses range from 6 to 18 months in jail and/or a fine up to $5,000. DM2: These misdemeanors are less serious than DM1 charges. Examples of a DM2 offense include abusing toxic vapors, use or possession of synthetic cannabinoids, and possession of 2 to 6 ounces of marijuana. Penalties for DM2 offenses range from 0 to 12 months in jail and/or a fine up to $750. DF1: Examples of a DF1 offense include the distribution of any amount of schedule I or schedule II controlled substances to a minor (if the adult is at least 2 years older than the minor); or the distribution of ANY material that has specific amounts of schedule I or II controlled substance combined. Penalties include mandatory minimum sentencing from 8 years up to 32 years and fines up to $1 million. DF2: An example of a DF2 offense include distribution of any amount of schedule III or schedule IV controlled substance to a minor (if the adult is at least 2 years older than the minor). Penalties include sentencing from 4 up to 8 years and fines up to $750,000. DF3: A level 3 drug felony might include distribution of any material that weighs 14 grams or less, and the material contains a schedule I or II controlled substance. Penalties include sentencing from 2 up to 4 years and fines up to $500,000. DF4: Level 4 drug felonies are categorized as DF3 except when distribution is for the purpose of sharing use of drugs at “a time substantially contemporaneous” with the exchange of drugs. Penalties include sentencing from 6 up to 12 months and fines up to $100,000. Presumptive sentencing is most common and the default sentencing range; however, aggravating factors, such as the offender’s criminal history, parole status, etc., may persuade a judge to apply an aggravated sentence, which favors tougher sentencing and fine requirements. A trial by jury is available to people who are charged with a Colorado drug crime. For first- and second-time drug offenders, Colorado has implemented special “drug courts” where defendants can enter into treatment programs in lieu of fulfilling a sentence. Everyone makes mistakes, and sometimes bad things happen to good people. Colorado drug laws are complicated, but we can help. Knowing who to call, when to call them, and what not to say to law enforcement is the first step in building your defense. What you don’t know about Colorado’s drug laws can hurt you. When you need a Denver criminal defense lawyer, you need Wolf Law. Call us at 720-479-8574 or contact us online for a free case evaluation. Drug cases are one area of the law, where you can really be charged at any level. You can be charged at the petty offense level in municipal court, at the misdemeanor level in county court or at the felony level in the district court. All of those charges can come with different sets of penalties and it’s important to have an attorney who understands the difference. At Wolf Law I handle all types of cases and drug classifications from pills, marijuana, heroin, cocaine, any drug offense that you have and any type of charge you’ve accrued, from any type of drug there is, at Wolf Law I can handle that type of case. It’s important to have an attorney who understands the drug laws, understands search and seizure law, which is so huge in drug cases and that’s something I do for my clients. I understand that sometimes my clients are dealing with dependency issues; addiction, things like that. And those are things that need to be handled sensitively, delicately, but not ignored. Too many lawyers go in with a blunt instrument, rather than coming in with a scalpel to try and deal with dependency and addiction issues, make the judge aware of it, make the prosecutor aware of it, and get someone the treatment they need. At Wolf Law, I always want to make sure that when you come in, I understand what’s going on in your life, what’s caused the issue to happen and try to find a way to help you.